Choose this brilliant display of orange blooms that's as tall and bright as a summer campfire. 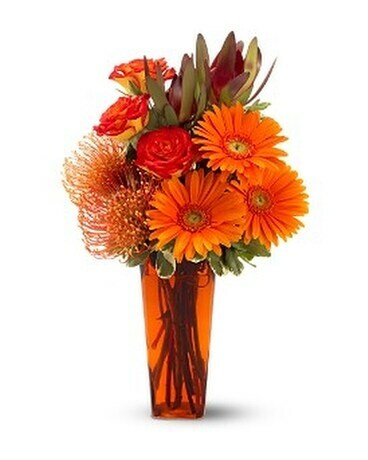 Hot orange gerberas and roses mingle with exotic tropicals to create a floral gift that will warm their heart. Orange roses, gerberas and pin cushion protea – accented with leucadendron and variegated pittosporum – are delivered in a tapered orange square glass vase.